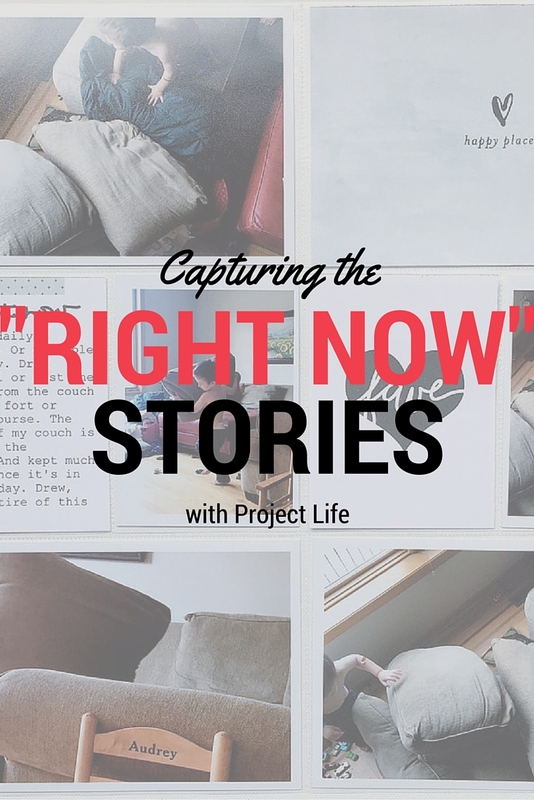 In this Project Life Layout, I'm using the Everyday Core Kit that I purchased on the Project Life App to document something that has been occurring regularly in our house with my two-year-old. 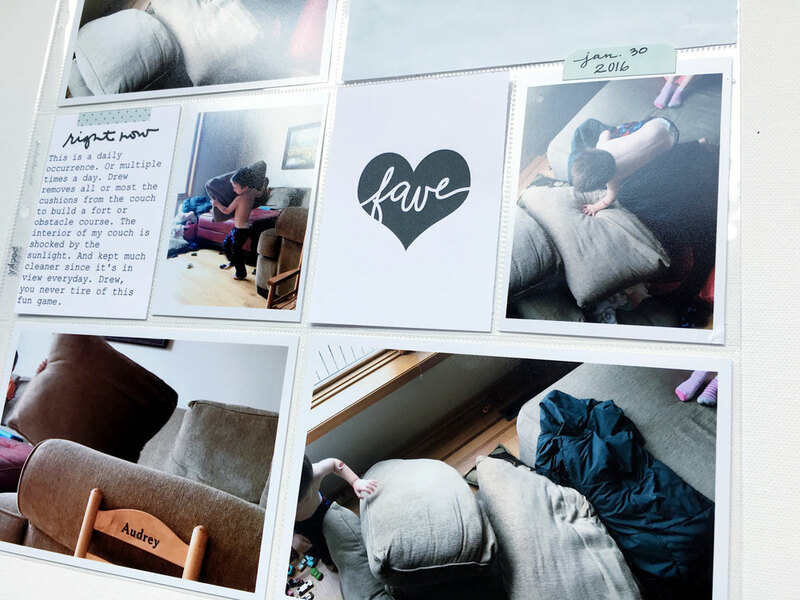 I am loving this layout and want to incorporate more of these kind of pages in my albums. 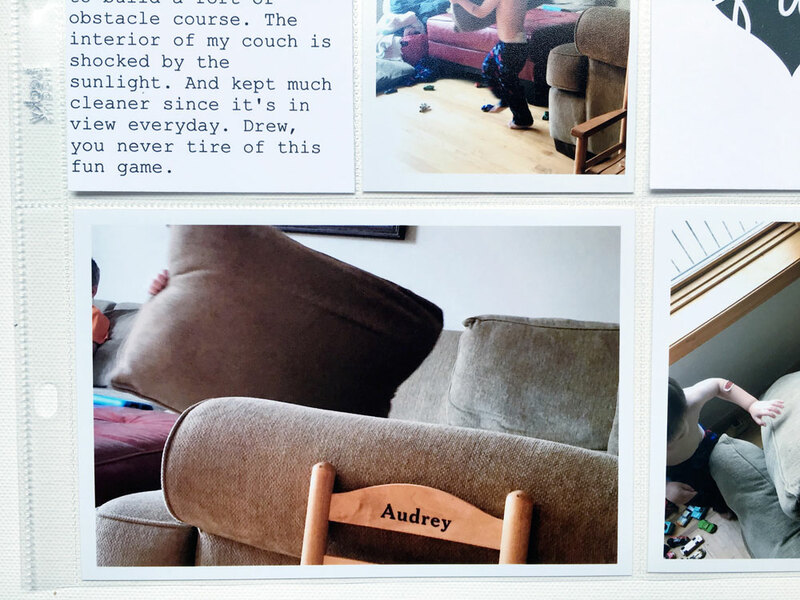 I was sitting and drinking my morning coffee, as I watched for the umpteenth time as my son unassembled our couch cushions in his fort-building efforts. Look at this bottom left photo! It was so cute to watch him carry these giant pillows to his "spot". All I could see was a hand on either side of the pillow. After watching his building from my chair for a few minutes, I decided to get some shots from a different angle. I love overhead shots that give a new perspective. I've been allowing myself to buy a new $1.99 or .99 card set in the Project Life App every once in awhile. They are fun to have and I love that I can print them with square edges. 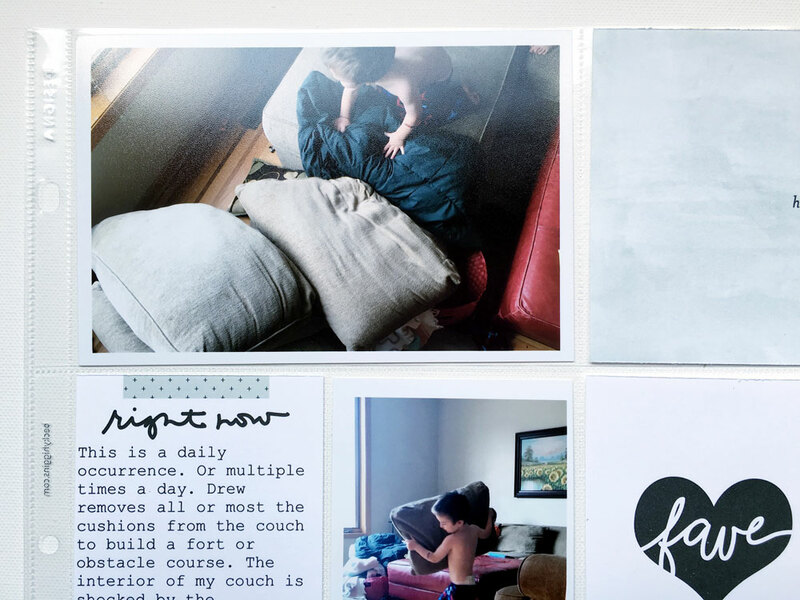 I've been printing my photos with white borders and love the squared edges on the cards. It looks clean and crisp. I've talked in past posts about how I pre-plan my pages using the Project Life App. It has done a few things for me to better my PL Process. It helps me keep up with the journaling. Click on the badge below for the Project Life App for iOS or here for the Android Project Life App. 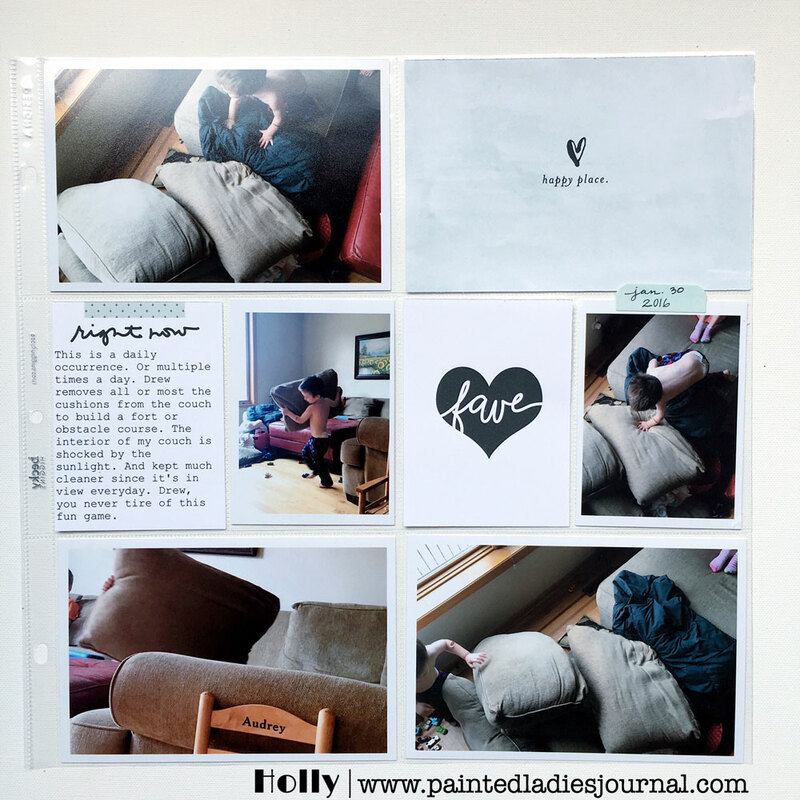 I'm currently working on a detailed tutorial for how I use the Project Life App for planning and keeping up, so sign up for the Painted Ladies Journal Newsletter here or click the image below to be notified when that comes out. It's been on my to-do-list for awhile and I'm excited to finally be sharing this with you. If you are going to start printing your own cards from the app, I highly recommend getting a home printer. I have bought a Canon Pixma the last several times and I love them. I'll tell you why. DISCLAIMER: I'm not a printer expert, I can only share with you what I have experienced. They let you keep printing to squeeze out the last drops of ink from each tank. (Which is OK, if you are just printing something from the web or other 8.5x11 stuff. Not a great idea, if you are printing cards or photos). Some other brands stop printing when an ink cartridge gets to a certain low point, even if there is still ink. You can use third party inks. Again, a little disclaimer, some would say you should ONLY use Canon ink in a Canon Printer for the best quality prints and to keep your printer running for a long time. I haven't had any problems. It has a 4x6 tray. I can use the same machine to print 8.5x11 stuff. And I can scan or copy with it. I'm all about having less items and can do more tasks. You can pick up a Canon Pixma for a very reasonable price. Below is the model that I currently own and am loving for quick layouts. Now, I also like to print bigger batches through my favorite print lab, Persnickety Prints. The majority of my photo prints come from their lab, which are high quality and will probably have a much longer life span in my archival albums. But, for those projects you don't want to wait on photos for, or to print cards, I use my trusty Canon Pixma. I use the matte paper for cards and the photo paper for photos. Disclaimer: Some of the links in this post are affiliate links. I ONLY provide affiliate links for items or services that I truly love and stand behind because they deserved to be shared. If you choose to shop with me today, a small percentage benefits this blog and doesn't cost anything extra to you. Thank you so much. Connect with us on Facebook. Follow us on Instagram. Happy Day Stamp and Washi Tape Tip! I Tried the Shotbox for Photographing Stuff!